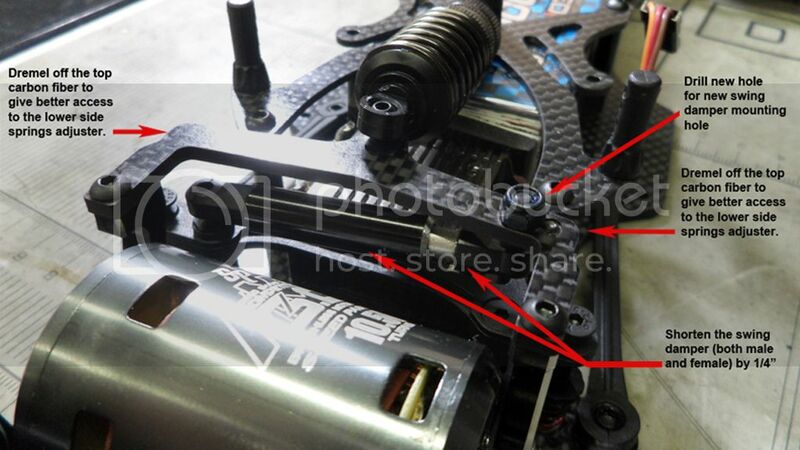 anyone else notice that the rear end movement is limited when you start to adjust the side spring screws? or am i supposed to leave the screw fully engaged and turn the spring nut? I don't turn that spring plastic nut...I turn the screw in and out. When you say it is limited...limited how? I mean, the rear pod cannot turn 180....can you describe HOW that is limited..? In what direction or in what form...? pod movement is limited because the damper mount on the rear pod hits the screw on the side springs, pod pivots a lot more one direction now then the other. I'll try to take some pictures when I'm on lunch break for you. I've never had a pivot link rear end I could be doing it wrong. (2)...instead of using the button head, like me...I use a long set screws. Set screws dialed all the way in and flush with the battery holder..that give you even more room between the side damper mount and the battery holder. Hello guys, I need some help with gearing. At my club we race 21.5 stock and they use 2.2 fdr.... The problem is that I cannot fit a bigger pinion than 25t with the 72t spur. Is there a solution for this? I know I can change the spur with a smaller one but at the moment I don't have it and I can't find to buy locally. I need this for Sunday so I better find a solution how to make it faster with a 2.7fdr. I am using the speed passion 21.5R. Do you think I can fit an MMM sensor board ( red) so I can set timing more? This way will I have a hot motor result? If you switch to 64 pitch you can get lower final drive ratios. Before the IIC I was running 2.5 fdr on our track and switched to 2.8 fdr for the IIC and stayed with that locally when I got back. How and why are you adjusting the screws? The way it's suppose to be done is that you screw the screw all the way in, and then you turn the spring retainer out until it touches the surface it will be resting on (with stock setup, the top of the side links). To achieve that, I used aluminum spacers to give me the exact same setting on both sides (I believe 4 or 5mm). If you run the side links on an angle, you will need a longer screw and more spacers to sit the spring down on the chassis directly. If you want more tension from the springs you need to get stiffer springs. Compressing them by turning out the screw retainer does not change their rate. Oh, I think I misunderstood the question, but looks like Solara may have answered it. Sorry! Solara's answer is one solution (cutting the parts) what I did is I replaced the SP ball end with an associated short neck ball end and got some extra travel. Does the car ever actually flex that much under normal racing conditions? I'm having a hard time visualizing the pod rotating far enough to make this an actual issue. Thanks for the help guys, that answered my questions. I race on carpet and my car would turn better to the right than to the left until I screwed the spring holder all the way in (like you posted) and added the asc ball stud. I really HOPE you are talking about 2.7 final but not 2.2 final....2.2 final, you will buy alot of new 21.5 because you will fry them on each run. To get to 2.76 final, you will need a 26T pinion, which is not possible....however, what I did is dremel the motor screw slot further so you can slide down the motor more toward the front...you might be able to squeeze in the 26.....I am running 24 and I have never use the full power. Well everyone runs with 2.2 fdr at my club... We have a very long straight. We race outdoors on asphalt and circuit is also used for 1/10 gp cars. Do you think that if I put in the red sensor and put timing to max, it won't fry the motor with 3 fdr? Interesting... do you have a part number for that AE ball end? No, it won't....we ran more timing on 21.5 for around 3.8 final on GT. Ok thanks for your help.... I will post results after race. Hope everything goes well and finish my races without any problems. All times are GMT -7. It is currently 05:53 AM.